Katie Workman, author of the new hit cookbook The Mom 100 Cookbook is coming to the Westport Public Library on Thursday, May 10 at 10:00 a.m.
Katie Workman is the founding editor in chief of Cookstr.com and a mother of two. 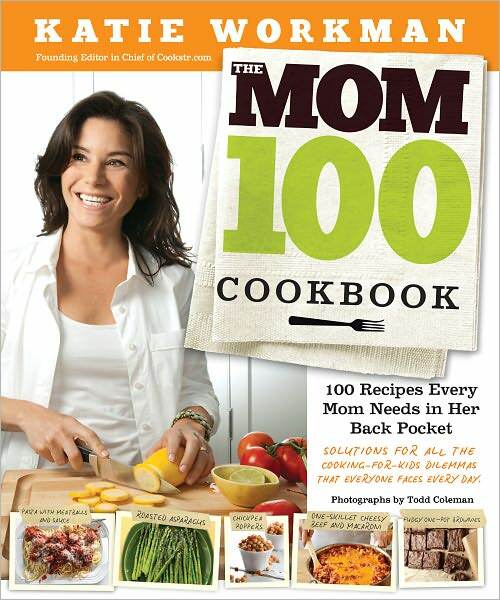 In The Mom 100 Cookbook she delivers solutions to the 20 most common cooking dilemmas that every modern mom faces, providing recipes and tips for parents who are so baffled by their kids’ food preferences that mealtime has become a minefield. Katie Workman will talk about her new cookbook The Mom 100 Cookbook, answer questions from the audience, and give a book signing. WHEN: Thursday, May 10 @ 10:00 a.m.
1. There must be a better way to get honey or molasses out of the measuring cup! Spray your measuring cup with nonstick cooking spray before pouring the sticky ingredient in. It works every time! 2. Bake your bacon instead of frying it. If you lay the bacon strips on a wire rack placed on a rimmed baking sheet and bake them in a preheated 400°F oven for 20 minutes, you’ll get nice crisp flat strips, and save yourself the trouble of cleaning an oil-splattered stovetop. 3. Use two different vinegars for a delicious basic salad vinaigrette. This creates a very nice kind of layering of flavors and takes the vinaigrette to a slightly higher level. Some favorite combos: red wine and sherry vinegars; balsamic and red wine vinegars; white wine and unseasoned rice vinegars. 4. Cook in big batches. There is little point to making a small batch of tomato or meat sauce, soup, chili, or stew. Making a big batch, or doubling the recipe, usually takes only a small amount of additional time and enables you to freeze enough for another meal (or two!) for your family..
5. Freeze unexpected foods in freezer-safe zip-top bags. Soups? Stews? Chili? Yes! Fill the bag about an inch shy of the top, zip the bag almost completely closed, gently press the air out, then seal completely. Freeze food in the portions you will likely want to defrost, and label all food with the name of the dish and the date you froze it. 6. Prep the coming week’s produce in one sitting. If you mince and chop garlic, shallots, onions, broccoli florets, and other veggies ahead of time, you will thank yourself all week long. If you have a food processor, you can just pulse everything up, one at a time, and have yourself an arsenal of prepped ingredients at the ready. Store each ingredient in a tightly sealed, labeled container in the fridge. 7. Experiment in a comfortable way. If you’re interested in trying a new spice, add it to some of the roasted potatoes you’re making. This way, if it turns out the flavor is not your thing, you’ll see if you like it without jeopardizing all the potatoes or a more involved main course.